From practicing drawing some dead leaves. 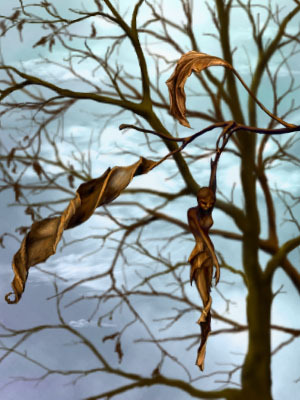 I decided that part of what's cool about Brian Froud's faery art is that he makes even dead things (like that dry leaf cruft on the ground) look good. So I figured I needed practice anyhow so I found a few leaves I liked and drew them. Then I put them together and liked that. And then I was going to draw one from my imagination and it turned into the leaf lady. Then I remembered the wintery cold skies look from when I was little.